When planning a fundraising event, one of the most worthwhile ways to prepare is to take a look at what has worked for others. By studying the successes other silent auction hosts have been able to generate, you can determine which strategies would work for your event, and apply the methods that seem most promising. Plus, event planning professionals are constantly coming up with new and exciting ways to create buzz around the events they organize— making them valuable resources. If you’re looking to host a silent auction fundraiser that is a step above the rest, this is the article for you. Melanie Woodward, a highly-regarded event planner who has organized events for Honda, the Young Entrepreneurs’ Association and HGTV, considers proper venue selection to be one of the most crucial tips for running a silent auction. Can the venue handle the projected number of guests for my event? Is there on-site parking? Is it free, or is there an associated cost? Is it underground parking? Is the venue close to public transportation? Is the atmosphere right for the type of ambiance I want my guests to experience? Do I want my event to feel casual, or formal? What time of the day is my event being held? What type of dress code will my event have? Does my venue reflect the calibre of event I am aiming for? Sarah Haywood is well known in the event planning industry for organizing and overseeing unforgettable weddings. But her approach to guest satisfaction can be applied to any event type. By ensuring your event adheres to a pre-planned schedule, you can reduce the likelihood of guests getting bored or experiencing lulls. You can also implement fun, creative ways to pass time, like a photo booth or a presentation by a special guest speaker. The more inventive your ideas are, the better! The highly-experienced team of event planners at JDC Events, based out of Washington, DC, know what it takes to hit a home-run when planning a corporate function or non-profit event. Before digging into aspects like decorating or scheduling, this dedicated team of experts begin their process by asking a simple question: what is the purpose of this event? How do we engage participants? What worked well in past events? What didn’t work? What do we want to achieve with this event? Do we have the human capital and financial resources to support the event? 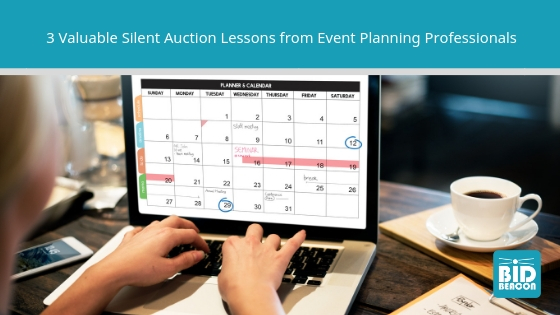 By taking these valuable tips for running a silent auction, and combining them with the convenience and efficiency of an online auction software, you can drastically improve the odds of your event being a major success. The Bid Beacon silent auction app has a ton of value-adding features that can help simplify your event and provide a more pleasing guest experience. ARE YOU INTERESTED IN USING A BIDDING APP TO ENHANCE YOUR NEXT SILENT AUCTION FUNDRAISER? CONTACT US TODAY. YOU WON’T BELIEVE HOW EASY IT IS TO GET STARTED.